St. Jacob’s is a very large and very busy market, with much more than just food stalls. To be honest, we ignored most of the other wares. That part kinda felt like going to The Ex; not really what we were looking for. Here, you can get large quantities of things like peppers or tomatoes for a ridiculously cheap price – unlike some of the Toronto markets. 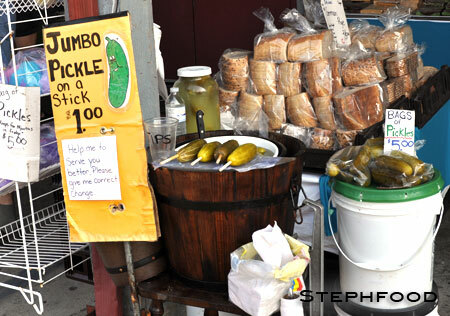 Clearly, they expect more canners at the St. Jacob’s market than at St. Lawrence. I was happy to see a variety of summer sausages, apple butter and baked goods. Then we moved on to Kitchener. 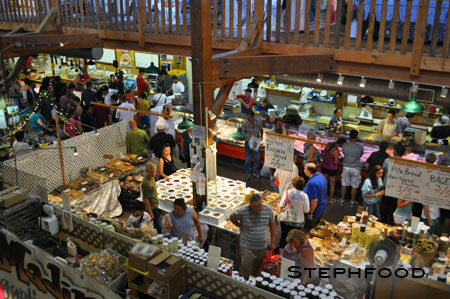 It was strange being at the Kitchener Market again, after so much time had passed. From what I understand, it’s actually in a different building than the one I went to as a kid, and it looks and feels very different. In fact, I thought that the St. Jacob’s market building brought back more childhood memories – even though I had never been there before! 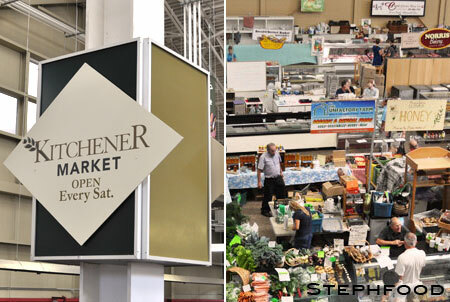 This is why I chose a photo of me at the St. Jacob’s market in my last post about going to Kitchener as a child. It felt right. That said, I can’t say I was disappointed. We found nearly everything we wanted between the two markets. I’m always amazed at how different each market feels. They may have much of the same produce, and even some of the same vendors, but there is a different vibe in each market you go to; my attention is drawn to different things.